This. Just, this. Because we know exactly what sort of attention, care, therapy and adoration we lavish on our kids. 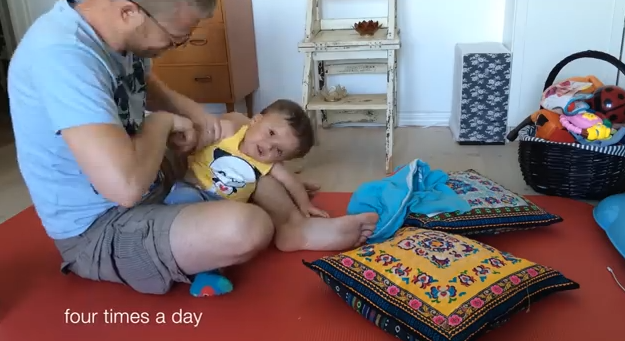 And this time-lapse video dad Carl Rytterfalk shot of his morning with his son William, who has mosaic Down syndrome, shows it. Wow i'm exhausted just watching this I should thank my parents more often for all they do for me. I found myself laughing at some of the sections. How does a feeding machine work? When you have a Gtube (placed through your abdominal wall into your stomach) you can hook it up to an "I.V" type of pump, and it will dispense the formula. My lil guy has one too, but he can take his food in bigger amounts now, so he doesn't need the pump now. LOVE THE KUNG FU!!! & SOOOO very thankful we never had to use a feeding machine with our son !! Children change our worlds. This is love.